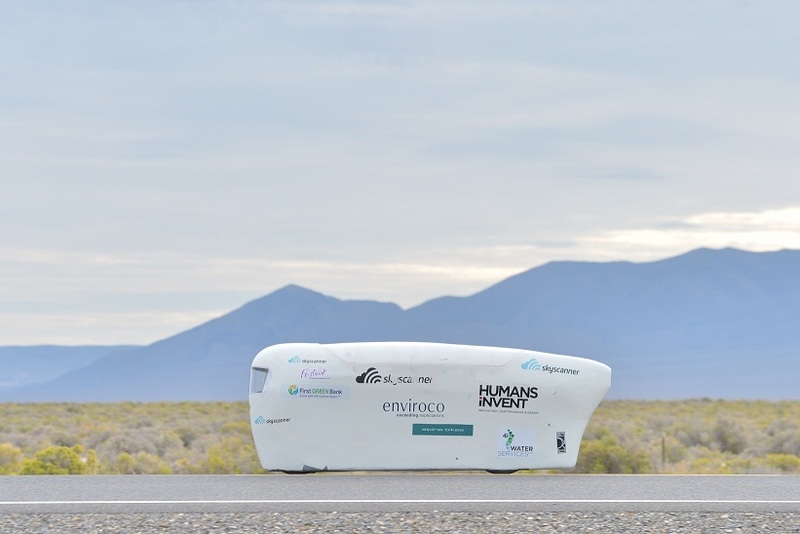 In September 2013, Graeme Obree travelled to Battle Mountain, Nevada, in the hope of breaking the Human Powered Vehicle (HPV) world speed record of 82.3mph in his homemade creation, the Beastie. 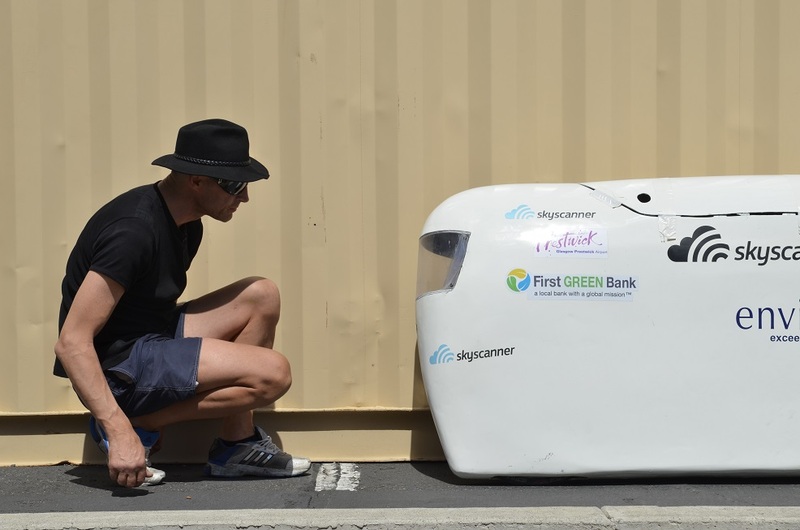 Rick Robson followed the Beastie’s development, and travelled to the United States with Obree for the World Human Powered Speed Challenge. Here he recalls the adventure. In early 2012 Graeme Obree first showed me his kitchen table creation: the rolling chassis of the HPV. He asked me not to mention the transmission in my piece for CW (“I’ve not quite got it sorted yet,” he said) but a few months later that 286-inch fixed transmission was complete and Obree showed me a demo run at 30mph on Seaview Road, Saltcoats. The machine was called ‘Exhibit B’ until an email from Sir Chris Hoy, enquiring how the ‘Beastie’ was going, provided the perfect name. While the fastest HPVs in the world are in ‘supine’ positions (lying back, feet first) the Beastie would be a ‘prone’ machine (head first, feet at the back). The Glasgow School of Art initially created an acrylic shell for the HPV, yet it misted up and was deemed too flimsy if there was a crash. Obree had to delay his 2012 attempt on the record and instead set about making his own shell from fibreglass and Kevlar at home. During the first test at Glasgow Prestwick Airport, without the lid in place, the Beastie reached around 45mph. However, after two bouts of surgery for Obree, the already very snug Beastie needed five centimetres of extra padding to provide hip support. 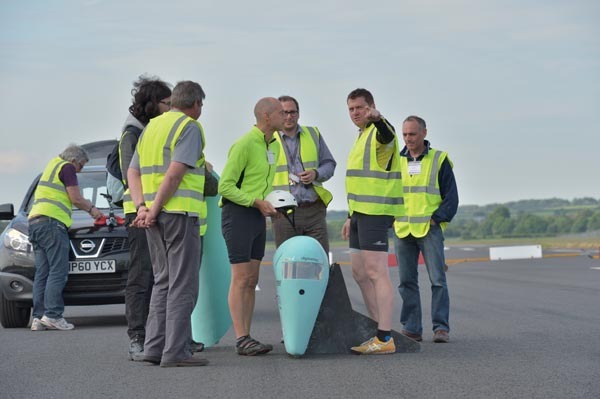 Obree had no choice but to chop the top off the shell and add five centimetres of extra fibreglass all the way around the shell, adding a significant 150cm2 to the frontal area. The final Prestwick test last summer was a full dress-rehearsal for the Beastie, yet the crank arms bent under the force and the run ended with Obree keeling over on to the tarmac and another Obree race-against-time ensued. A few days later a repaired and repainted Beastie was crated and shipped to the US. The flight to the US went quickly, largely thanks to Obree’s endless supply of stories about the mid-1990s Great Britain track team hi-jinx, involving climbing from hotel windows, South American discos, vodka and the odd giant cigar. When we arrived in Salt Lake City, we collected the Beastie and headed up to Battle Mountain, the town with an intriguing tag line: ‘The Armpit of America’. We checked into the hotel, I dumped my bag in my room (which smelt like the town’s tag line) and headed straight out to the bike check. It would be fair to say that I had grown to like the Beastie’s rustic, workmanlike beauty, yet the other machines at the bike check were like pristine, spotless, Formula One racing cars. Seeing these creations of engineering excellence gave me the first inclination that HPV riders were not a bunch of ‘beardy weirdos’, and that this could be a huge challenge. As well as the machines, there were some big athletes around too, including Jan Bos, brother of Belkin pro Theo, and an Olympic team sprint rider in his own right. With the Beastie through the safety check we headed to the five-mile stretch of Highway 305, where the week’s action would take place. The asphalt had been specially laid for HPV records and was both super flat and super smooth. After a meeting at the town’s Civic Centre, the 28 cyclists from eight countries were ready for their Highway 305 test – something the then world record holder, Canadian Sam Whittingham, once likened to a track meet. Monday’s qualifying rounds would establish the ranking of fastest riders, with the top 15 or so getting to run in the slightly better conditions of the evening session. To photograph the action, I set up position at the end of the timing strip – and in accordance with the rules, approximately 20 metres back from the carriageway just at the exit of the timing strip. I hadn’t even thought there might be issues at the start; I had watched Obree start the Beastie plenty of times, so he should be OK… right? “Rider three is down, fall at start.” Oh bugger. I adjusted my photo spot, got ready and could see the Beastie twitching as it made its way towards the 200m timing strip. A severe twitch to the left almost saw the Beastie off the road before the timing strip gate, but Graeme corrected the steering and kept the machine upright. Back at the finish area the speed was radioed from the timing team: 46.8mph. Fast enough to qualify for the evening session, with many teams having serious issues on the first run of the week. We spent Tuesday at the Civic Centre showing the machines to local schoolchildren, which only highlighted the differences between the Beastie and its competition. In the far corner, academics from the 10-strong Delft Amsterdam HPV Team were analysing SRM data on laptops, making tiny adjustments with precision cutting equipment and checking their camera screen view technology. Meanwhile, Obree, trying to curb his language around the youngsters, was trying to free a reluctant 15mm bolt on the step-up gear of the Beastie, his hands covered in oil and a big spanner almost bending under the force. The Wednesday morning run looked good. With a 12 sprocket and front wheel weights somehow sourced by Obree’s manager, Charlie, the bike was far more stable. That was until I heard the distant sound of fibreglass meeting tarmac a few hundred metres after the timing strip. Back at the hotel the problem was fairly obvious; the rear wheel had pulled over and was smoking against the frame, allowing the chain to slip off. After a few minutes scouting the hotel car park, Obree had found an iron bar to help get the wheel realigned. Since the ‘smoky-tyre run’ was timed at just under 51mph, four miles per hour off the prone record at 54.9mph we were all optimistic for the evening run. However, the weather had other ideas and heavy wind and rain swept into town. Thursday suddenly gained extra significance for all teams. The end of the week was fast approaching. As the week progressed, the difference in speed between the Beastie and the Dutch, Swedish and French teams machines became even more noticeable. Obree sought guidance from the experts, including Thomas Van Schaik, a Swedish engineer whose machine Cygnus had reached over 75mph, despite Van Schaik being almost 7ft in height. “Come on Thomas, tell me the truth. The Beastie – it’s a dog isn’t it?” asked Obree. It was too late to knock up a new shell, but one of Van Schaik’s suggestions could be acted on straight away, and we taped up the hole at the back of the shell. It may have been handy for lifting out of the van and starting, but it was rubbish for aerodynamics. On the Thursday morning run, I watched the start of the action before jumping in the chase car to get the shots I needed. After another faultless push from Gary Ralston, the Daily Record sports journalist covering the attempt, Obree was away, holding the centre line as you would expect a former world pursuit champion to. Three miles in and his speed held at 55-60mph. But as Obree hit the kilometre-to-go board, it dropped, and was finally recorded at 52.9mph. Obree had another attempt. His speed picked up and recorded 53.3mph, but was deemed illegal because the wind was too strong. However, back at Battle Mountain’s Civic Centre there was good news, as Obree’s earlier run which recorded 52.9mph was declared a new world record for a prone two-wheeled HPV. The outright prone record, set by Speedplay founder Richard Byrne in 1983 on a three-wheeler at 54.9mph, was also within reach. I asked Obree how he felt about the record attempt: “Homer Simpson once said the key to happiness is to lower your expectations,” he replied. “Realistically, the outright world record is not possible in the Beastie. The prone world record is achievable, and if I can get the timing bang-on for a perfect run, the British record [67.4mph] could be possible. With the challenge nearing its end, it was time for the Beastie’s last run, although the ride very nearly didn’t happen. Just before the start, Obree realised that he’d forgotten his shoes and had to make a quick U-turn to get them. Once back at the start line, the Beastie’s first start resulted in a fall. The second attempt was also a fall and after a week of patchy jet-lag sleep, nerves were now shredded. 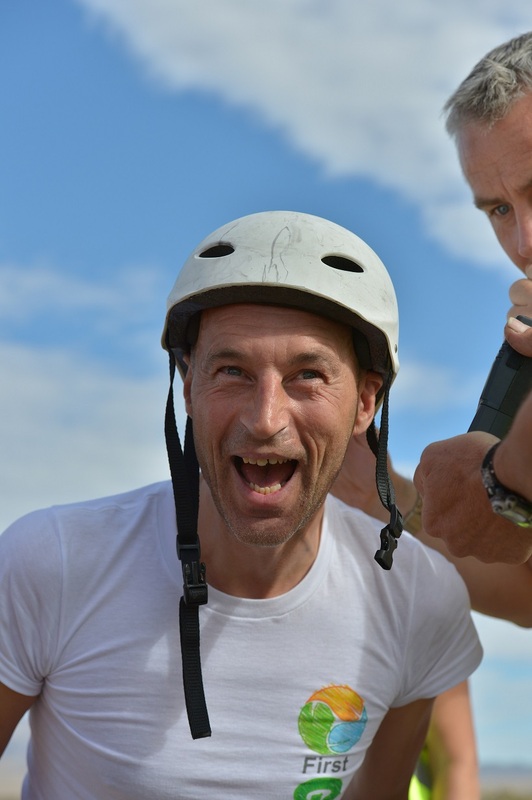 Luckily, a string of start-line fallers meant Obree had one more chance. The Beastie, now heavily flesh-wounded from the stresses of impacting the road too many times, was taped up and ready. As Obree left the chase car behind, rock steady on the centre line, his speed started to build, and inside a mile to go was hovering between 55-60mph. With the chase car team screaming, the Beastie hurtled through the timing strip. The radio from the timing team crackled into life. “Graeme and the Beastie…56.62mph.” With the last ever run in the Beastie, Obree had improved on Richard Byrne’s all-out prone record. 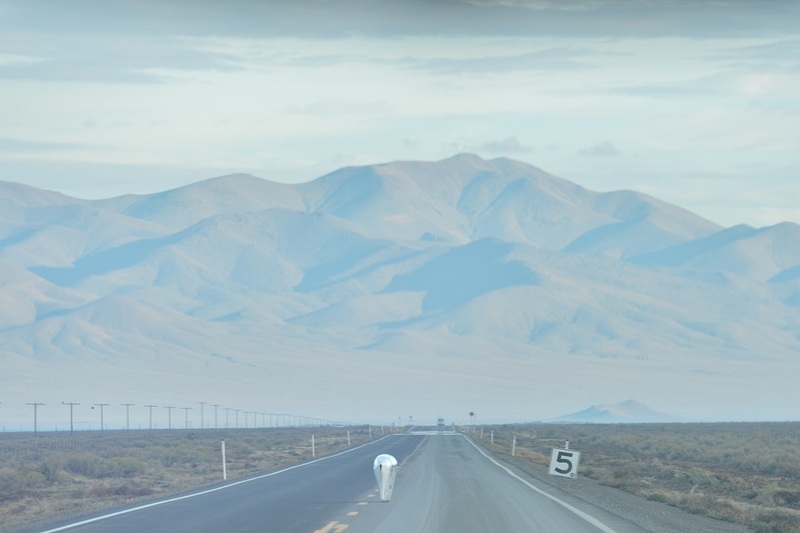 Despite getting another record sealed, Obree was not finished and before leaving Nevada, he got one last roll of the dice. After a week of borrowing tools and bits of kit, the Toronto University team had approached Graeme and asked if he wanted to have a go on their Vortex HPV, to attempt the British record. Sadly however, it didn’t quite go to plan with Graeme, unable to get used to the machines delicate handling, only recording 43mph. The Delft Amsterdam team however, had a better run on the last session, as Sebastiaan Bowier set a new HPV world record at 83.13mph. At a recent meeting in Glasgow, I asked Obree, with the benefit of hindsight, what he thought of the Beastie now. “Well, there was a lot of things wrong with it!” he said. “There was also a lot of things right with it too. “Turns out that the biggest thing wrong with it was the shell. I built it with the accepted cycling rules of ‘what is aerodynamic’, thinking a tear drop/wing shape was the fastest aerodynamic shape to cut through the air. Turns out it’s not. After all the highs and lows, I had to ask Graeme if he could be tempted to go for the record again? “Er, no!” came the response. I gave it a moment’s thought. No, don’t think I fancy it either.